In Photoshop Elements, when you click Share in either the Organizer or Edit Full mode and open the Share panel, you find Online Album at the top of the list. The term Online is a bit misleading here because you can use this sharing option for both online and local file creations. Photoshop.com. Choose this item if you want to upload an album to your space on Photoshop.com. Export to CD/DVD. Use this option to write an album to a CD/DVD that can be viewed on your DVD player. Export to Hard Disk. Choose this item to export files to a folder. Once the files are exported, you can view the album locally on your hard drive by using your Web browser or upload the files to a Web site so any visitor can view the album. If you want to share files on Photoshop.com or write a CD/DVD, follow the same steps but be certain to choose the appropriate option in the Share panel when you start the creation. Open the Organizer and select the photos you want to use for your album. Click Share in the Panels Bin and choose Online Album from the panel options. The panel displays several output options. This example uses the Export to Hard Disk option so files can be later uploaded to a Web site or written to a CD/DVD. Choose an option for exporting files in the Share panel. Click Export to Hard Disk and click Next at the bottom of the panel. If you created an album, you can open the Organizer, click the Organize button in the Panels Bin, and click the album you created for showing photos online. This option frees you from having to sort through the Organizer to find photos you want to add to the online gallery. You can first select photos in the Organizer, then click Share→Online Album. All the selected photos are added to a new album. Type a name for your album. If you create a new album instead of using an existing album type a name in the Album Name text box. Notice the two tabs in the Share panel. When you click the Sharing tab, the panel options change. At the top of the window you find a number of different template choices. 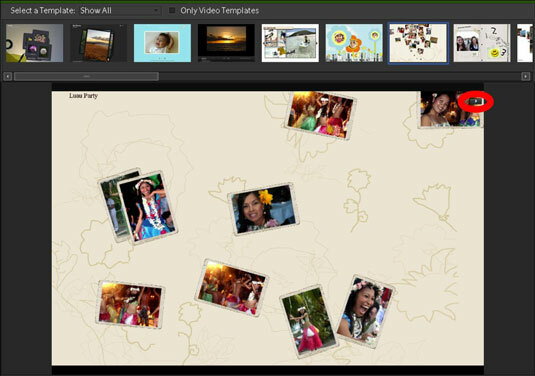 Click a template and preview your photos in the template view. At the top-right corner of the image window you see a tiny right-pointing arrow. Click the arrow and your slides are previewed. Click the tiny arrow to preview the slide show. In the Browse dialog box locate a target destination on your hard drive and click OK. If you want to create a new folder, click Make New Folder and click OK. Your files are saved to your hard drive. If you want to preview the album, you can open your default Web browser and open the index.html document on your hard drive.